Labour Bureau, Ministry of Labour and Employment has released All India Consumer Price Index for Industrial Workers for the month of October 2015. CPI-IW has increased by 3 points from 266 to 269, the highest increase witnessed this year. The increase in CPI-IW will be reflected in Dearness Allowance from January 2016 in respect of Central Government Employees including Railway Employees and Defence Personnel. 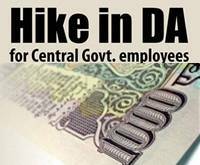 It was estimated last month that DA from January 2016 for Central Government Employees will be 125%. However, due to sharp increase in CPI-IW for October 2015, this estimation requires a small correction now. If CPI-IW for the month of November 2015 reaches 271 and remains at the same level in December 2015, then DA from January 2016 will be 126%, which is an increase of 7% from the present level. However, increase in DA more than 7% is unlikely as it requires at lease 5 point increase of CPI-IW in each of the coming two months. The All-India CPI-IW for October, 2015 increased by 3 points and pegged at 269 (two hundred and sixty nine). On 1-month percentage change, it increased by (+) 1.13 per cent between September and October, 2015 which was static between the same two months a year ago. The maximum upward pressure to the change in current index came from Food group contributing (+) 2.15 percentage points to the total change. At item level, Rice, Wheat & Wheat Atta, Arhar Dal, Gram Dal, Masur Dal, Moong Dal, Urd Dal, Mustard Oil, Milk, Chillies-Dry, Potato, Tomato, Green Vegetables, Tea (Readymade), Sugar, Cooking Gas, Electricity Charges, Private Tuition Fee, etc. are responsible for the increase in index. However, this increase was restricted by Coconut oil, Fish Fresh, Poultry (Chicken), Onion, Apple, Soft Coke, etc., putting downward pressure on the index. The year-on-year inflation measured by monthly CPI-IW stood at 6.32 per cent for October, 2015 as compared to 5.14 per cent for the previous month and 4.98 per cent during the corresponding month of the previous year. Similarly, the Food inflation stood at 7.50 per cent against 5.71 per cent of the previous month and 4.48 per cent during the corresponding month of the previous year. At centre level, Jabalpur reported the highest increase of 10 points followed by Tripura and Ludhiana (9 points each), Ghaziabad, Kodarma and Vadodra (7points each), and Sholapur and Guntur (6 points each). Among others, 5 points rise was observed in 9 centres, 4 points in another 9 centres, 3 points in 10 centres, 2 points in 13 centres and 1 point in 12 centres. On the contrary, Giridih and Chhindwara recorded a maximum decrease of 4 points each followed by Ranchi-Hatia and Haldia (3 points each). Among others, 1 point decrease was observed in 4 centres. Rest of the 9 centres’ indices remained stationary. The indices of 35 centres are above All India Index and other 42 centres’ indices are below national average. The index of Angul-Talcher centre remained at par with all-India index. The next issue of CPI-IW for the month of November, 2015 will be released on Thursday, 31st December, 2015. The same will also be available on the office website www.labourbureau.gov. in. Delhi’s Janlokpal Bill – Why is it Creating a Jitter?